Ah, gentle readers, it's that time of year again, when chocolate is shaped like hearts and the stores are swathed in pink and red. Yes. It's Valentine's Day. 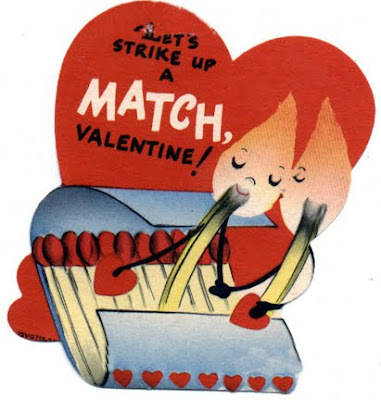 While your MatchGirl is not one for going over the top on this day, she is very glad to have all of you, dear ones, as her Valentine. Stick Boy liked Match Girl, He liked her a lot. He liked her cute figure, he thought she was hot. But could a flame ever burn for a match and a stick? It did quite literally; he burned up quick.